The United States of America will be needing thousands of caregiver for the next decade. According to Aquilina Soriano Verzosa, Executive Director of Pilipino Workers Center, the aging population of America is one reason why they need caregivers. She said the baby boomers are in retirement age and every day there are more than 10,000 people turns 65 years old in the country. She added in the next 13 years, there will be a million caregiver shortage in America. But one problem for Filipinos to access this job is the "America First Policy" of President Donald Trump which means, jobs should be given first to Americans before the migrant workers. But according to PWC, Americans don't like caregiving jobs because it is considered as a low-paying job that is why migrant workers fill in. Another problem they see is the tension in the relationship between US and Philippines due to President Rodrigo Duterte's remarks against America. 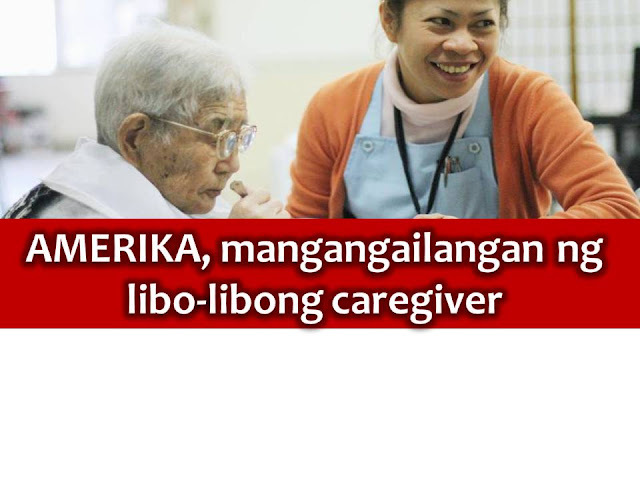 Filipinos are among the number 1 caregivers in the US. DOLE to OFWs: Undergo proper medical exam!